Kyle Chandler is loving life. With a successful show, gorgeous wife, two great kids, and now, building a life in Austin, this megawatt star is on top in one of the most difficult industries. In an exclusive to us, Chandler shows how he’s playing it smart, giving back, and becoming an actor. There’s a phrase we have here in Texas, as well as many other places, that just may be the best compliment to receive: being called good people—as in “he’s good people.” Ladies and gentlemen, Kyle Chandler is indeed good people. The phrase is one that Chandler often heard growing up on the family farm in Loganville, Georgia, too, spoken by his parents, who taught him the value of working hard and, yes, becoming good people. With those philosophies in mind, 43-year-old Chandler approaches his starring role as a TV football coach Eric Taylor with gusto, much like he approaches life. Chandler is still a powerful presence in any room today, as I witnessed when he sauntered into Jeffrey’s restaurant in Austin. Every head in the room turned when he made any move. Based on his height and affable charm, he recalls a young Rock Hudson from the film 1956 film Giant, one of the most iconic movies ever made about Texas. 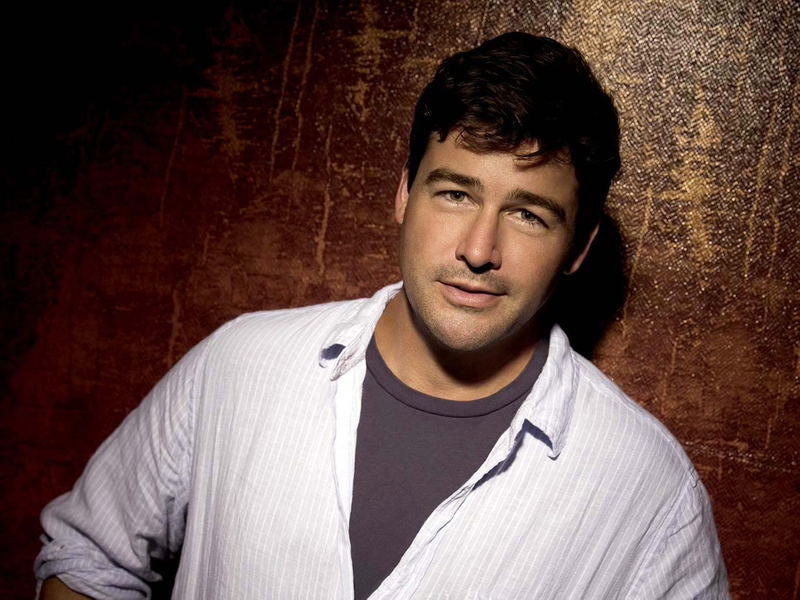 Real, earthy, and full of good intention—that is Kyle Chandler. Such charity is the karma given and received by good people. Chandler’s story is similar to many other actors of another era—small town boy does good. Born in Buffalo, New York, and raised in Georgia farmland, Chandler made his move to Los Angeles after a talent scout spotted him. Catching an acting break is never easy and Chandler’s did not immediately reap the rewards of his West Coast pilgrimage. For the first 18 months in Tinseltown while attending acting classes with Milton Katselas, he worked at the Museum of Natural History. “I poured beer and sold souvenirs,” he recalls. Chandler eventually he hit the jackpot with several successful shows such as Homefront and Early Edition, both of which ran on ABC for several seasons. He fit right in with the boldface names, co-starring in The Lyon’s Den with Rob Lowe and What About Joan with Joan Cusack. “I’ve been proud of a good 80 percent of what I’ve done, so I think I’ll take that and run with it,” he muses modestly. Chandler also graced the big screen in King Kong and The Day the Earth Stood Still. When director Peter Berg originally met him, he offered him a role in a television series based on his hit film, Friday Night Lights. The two forged quite the working friendship as Chandler then landed a part in The Kingdom, also directed by Berg. The television series Friday Night Lights centers around a small town with big values, both in football and in life. 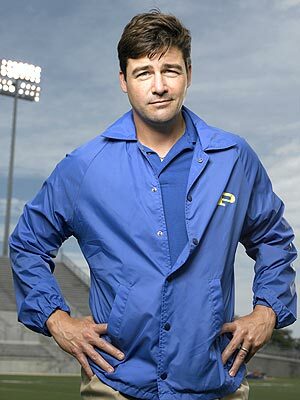 After he garnered critical success for his Emmy-nominated role on Grey’s Anatomy, the character of Coach Taylor seemed tailor-made for Chandler: deep, thoughtful, and trustworthy. When he got the part, it became clear right away that he was the best man for the job. “Working with Kyle on FNL is wonderful in many ways,” co-star Janine Turner asserts. “A) He is simply yummy to look at—I joke that he looks like the boy who was my high school crush! B) He is a first rate and committed actor. His Texas accent is perfect. And C) He is a good person with a great heart." In fact, much of the affection that comes through the show and its actors is genuine. “There are a few different reasons for me having a passion for the show,” Chandler says. “One of them is the process: it starts with the people, all the way down to the producers, the writers, and the actors. And say nothing of my love and admiration for the creator Peter Berg—that’s a whole other story. The other thing is this town; it’s one of the main characters as are the people in this town.” He is referring to working in Austin. “Having done the show here, one of the first things people did say after it aired was, ‘Thanks for representing people in the South with respect.’ That was the first idea that we were doing something really right,” Chandler explains. Chandler and his wife Kathryn, whom he met at a dog park in Los Angeles, have both enjoyed working in Austin. “Every time we come to Austin, we fall a little more in love,” Kathyrn shares. “This city can do that to you.” They’ve grown so fond of the area that they have bought land west of the city to build a dream home and immerse themselves in the Hill Country. The Chandlers have two daughters, Sydney and Sawyer, who will be transitioning from Los Angeles to the Texas lifestyle when the show enters its fourth season. “Hey, you don’t often get second chances in life and I enjoy playing [Eric] because he’s such a strong character and he’s got his idea of right and wrong—his moral compass,” he offers. “I like when he screws up and when he makes mistakes. I enjoy his humanity.” Beyond his good intentions, charitable ways, and family man persona, Chandler’s acceptance of flaws and the gritty part of life makes him real, good people and a real good actor.